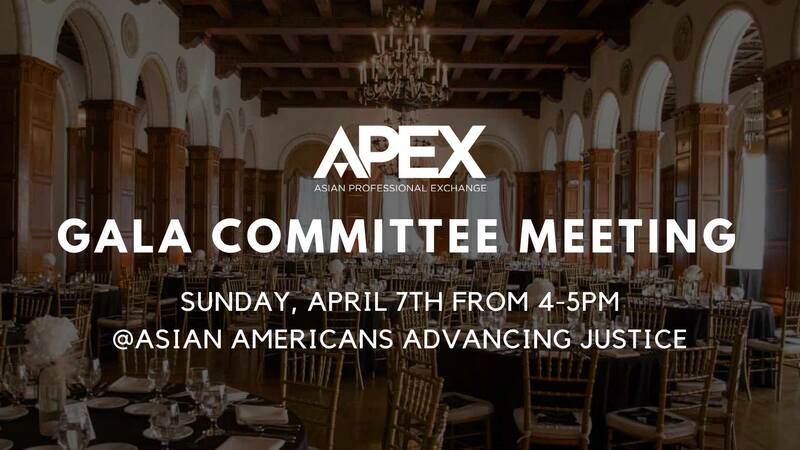 APEX | Asian Professional Exchange » APEX Annual Gala – Join the Committee! APEX Annual Gala – Join the Committee! It’s that time of year again! Interested in being apart of this year’s APEX Gala Committee? Well here’s your chance to help us plan our 26th Annual Gala. Come join us Saturday, April 7th. No prior experience required – just bring those your creative minds to plan the best Gala possible! Check the video/photo links below to see last year’s Gala. With your help and ideas, how can we make this year’s even better! The APEX Annual Gala is an event where the Asian Pacific Islander American community comes together to celebrate the organization’s past and present accomplishments. This annual fundraising benefit also honors the contributions of prominent Asian Pacific Islander Americans in the arts, community and corporate/business sector.